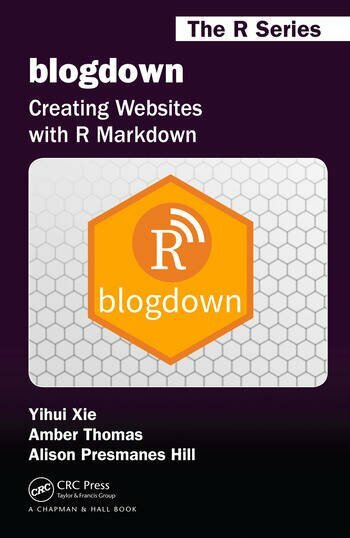 blogdown: Creating Websites with R Markdown provides a practical guide for creating websites using the blogdown package in R. In this book, we show you how to use dynamic R Markdown documents to build static websites featuring R code (or other programming languages) with automatically rendered output such as graphics, tables, analysis results, and HTML widgets. The blogdown package is also suitable for technical writing with elements such as citations, footnotes, and LaTeX math. This makes blogdown an ideal platform for any website designed to communicate information about data science, data analysis, data visualization, or R programming. Note that blogdown is not just for blogging or sites about R; it can also be used to create general-purpose websites. By default, blogdown uses Hugo, a popular open-source static website generator, which provides a fast and flexible way to build your site content to be shared online. Other website generators like Jekyll and Hexo are also supported. Migrate your existing websites to blogdown and Hugo. Yihui Xie is a software engineer at RStudio. He has authored and co-authored several R packages, including knitr, rmarkdown, bookdown, blogdown, shiny, xaringan, and animation. 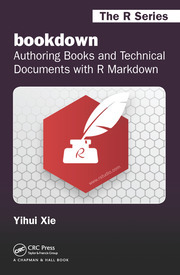 He has published two other books, Dynamic Documents with R and knitr and bookdown: Authoring Books and Technical Documents with R Markdown. Amber Thomas is a data journalist and "maker" at the online publication of visual essays: The Pudding (https://pudding.cool). Her educational background was marine biology, but she has a strong love of data analysis, visualization, and storytelling. Alison Presmanes Hill is an Associate Professor of Pediatrics at Oregon Health & Science University, where she teaches Computer Science courses on data analysis, data science, and visualization. Her research focuses on using computational methods to study the development of children with neurodevelopmental disorders, in particular Autism Spectrum Disorders. 1. Get Started. 2. Hugo. 3. Deployment. 4 Migration. 5 Other Generators. Appendices: R Markdown; Website Basics; Domain Name; Advanced Topics; Personal Experience.